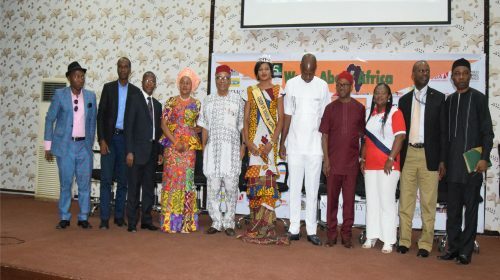 (L-R) Mr. Mr. Uwakwe Solomon; Mr. Pelu Awofeso; Mr. Ray Echebiri; Chinyere Nwanma Ogidi, the Convener; Chief Mike Ahamba (SAN), Chairman of the occasion; Miss Uzochukwu Favour, Tourism Queen, Ogun State; Mr. Ikechukwu Amaechi, Publisher The Niche Newspapers; Chief Charles Obi-Okeke; Stella Sawyer; Mr. Sam Adurogboye, GM, Public Affairs, NCAA and Mr. Okechukwu Ogunjiofor. Nigeria’s low ranking in the tourism competitive index has been cited by Nigeria’s Communications regulatory body as a deterrent to measuring its competitiveness, thereby making it difficult to truly measure the catalytic impact that Information Communications Technology (ICT) plays for development and growth of culture and tourism. 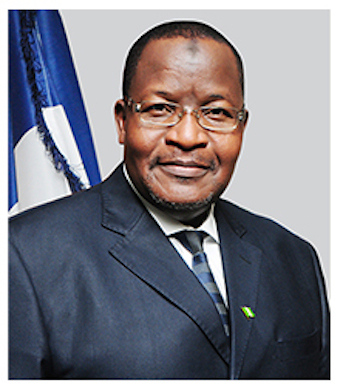 This was the position of Professor Umar Garba Danbata, the Executive Vice Chairman, Nigeria Communications Commission (NCC). Professor Umar was speaking on the theme, ‘ICT and Finance as Catalysts for Tourism and Culture’, at the 5th anniversary conference of Wakaabout Africa magazine, held on the 7th June at NECA Building, Agidingbi, Ikeja – Lagos. Citing the 2015 tourism Competitive index in which Nigeria ranked 131 out of 141 countries in review, he explained that while it is true that “ICT can provide a major catalyst for harnessing the potentials of tourism and culture, ICT cannot do much for a nation that has low tourism potential. Professor Danbata was represented at the conference by Mr. Reuben Muoka, Deputy Director, Public Affairs of the Nigeria Communications Commission (NCC). Professor Umar, notwithstanding shortcomings posed by the country’s very low ranking on the tourism competitive index, focused on the possible benefits of ICT and on the ground evidences of the impacts of ICT in the travel and tourism industry. ‘We therefore highlight how ICT can improve the culture and tourism potentials so that the government refocuses to make this industry very active, it will find ICT as an enabler”, he explained. Going on, as he looked at the country’s ICT industry and its impact on culture and tourism, he maintained that in Nigeria, though ICT may not have played very visible role or made significant impact as this audience may have expected, simply because of current level of development in the sector; nonetheless, the application of ICT has the potential to push up our mark. “Hotels and the hospitality industry are major components of the tourism industry. All over the world, ICT has become indispensable partner to hotel management and attraction of patronage. It is now a common practice for those who embark on tours to remotely select appropriate and cost effective hotel accommodations, make reservations and also pay for such services. ICT has made it possible for visitors to look at the hotel environment from their remote locations before they book and embark on their travel. “A number of international hotel booking portals currently exist where tourists can make and finalize their bookings. Following the current level of ICT development, such portals have emerged in Nigeria and are able to project Nigerian hotels from even the remotest parts of the country. “We now have booking portals like Jumia Travels, 9jahotels.com, Agoda.com, Hotels.ng, Nicestay.com etc. Tourists within Nigeria can find these sites available on the internet and have sufficiently improved choices for travels within Nigeria which big international sites are unable to provide for tourists. “ICT has also enabled Nigerian travels and tour organizations to play at the global level with complete bouquets of travel packaging, flight reservation and complete travel solutions. Such organizations include wakanow.com, now regarded as the biggest online booking portal in Africa. Another company, Travelbeta, has also emerged in this sector. It is important to note that the emergence, growth and operations of these organizations are driven by the availability of ICTs in Nigeria with which they are able to link with the global cyberspace”, Mr. Umar said. He also noted that Fortune.com has rated Nollywood as Nigeria’s biggest tourism and cultural export worth USD$3 Billion in 2015, as an industry which whose growth is accelerated by ICT, even as he enumerated several popular festivals and sites that can attract tourists by leveraging on ICT such as Osun Osogbo, Gelede, Eyo, Ojude Oba, New Yam festivals etc. Professor Umar indicated that the nexus between ICT and finance in catalyzing tourism growth is seen in ways that ICTs have enabled financial transactions as it relates to tourism liker the mobile money and cashless environment which has made it easy across the sectors of the economy including tourism to do business.